Archaeospeak: What could you discover? Personally, I thought the poster was rather striking. A brooding, raven-haired young man clad (we must presume) from neck to feet in plate armour, glaring defiantly (in a rather classic Manga pose), at his enemy; daring them on. All around there is carnage (evidently involving both men and horses). Above the scene, by way of an explanation, the text reads: "We led the search for King Richard III, what could you discover?" 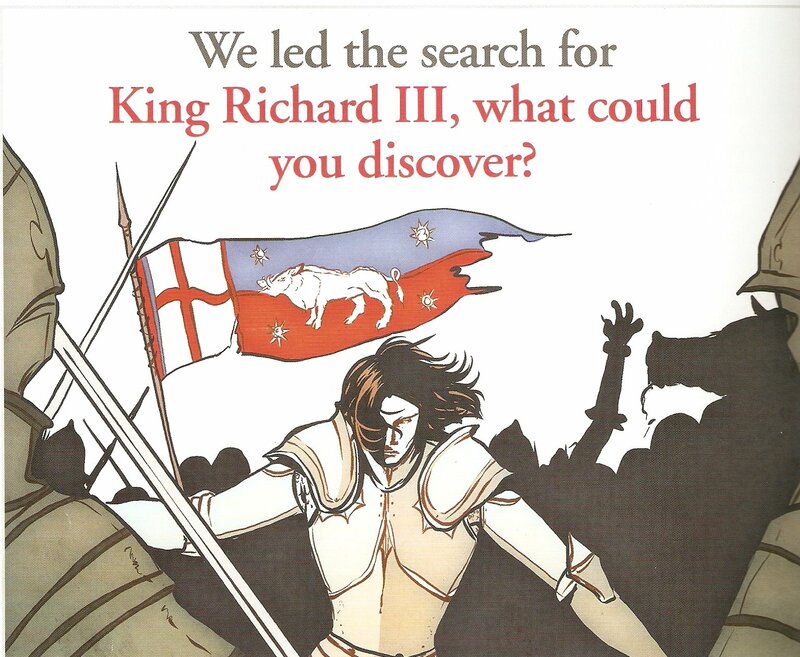 The image is part of an advertising campaign for Leicester University, who have (perhaps quite rightly) heralded their involvement in the discovery, investigation and identification of arguably England's unluckiest monarch. Not withstanding, as some have pointed out, the apparent 'non sequitur of the advertising slogan' (no, me neither), some historians and media-watchers have taken great offence, with much 'hrumphing' and 'tut-tuting' from within both serious academia and the more 'trivial' pages of the broad-sheet press. Archie Bland, correspondent for the Independent newspaper, was particularly irritated by the question "What could you discover?” adding "Well, gosh, I don’t know. Henry VII? Has anyone hauled him out of the ground yet?" Bland's criticism is aimed both at the "PR bods" for "putting such drivel out into the world" ensuring that something which "briefly seemed opaquely exciting, an insight into the past that stood at delightful odds with its mundane location, has been transmuted into yet another marketing exercise" and at the press for lapping it all up so whole-heartedly. I understand his point of view, for it is perhaps disconcerting to feel that 'discovery' (knowledge) is being turned into 'product' (profit). Also, we are talking about the consideration of and respect to the dead. These are, after all, the earthly remains of a real individual: a former living, breathing person with friends, family and feelings. 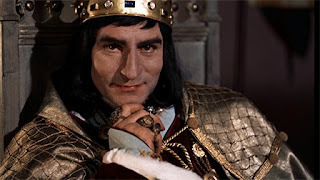 The fact that he has also (thanks to a double dose of the Tudors and Shakespeare) become one of the biggest villains in English history is, arguably, neither here nor there. Shouldn't we be honouring the dead, some might argue, not simply cashing in on them? Well, yes, perhaps in an ideal world that would be the case, but we do not currently inhabit such a place. What all universities need in this present day and age is a good, solid and highly inventive advertising campaign; something that catches the eye, stays in the brain and ultimately brings in the punters. All in all, I quite understand Leicester University's desire to play up the find. In this current economic climate, many Universities are not just 'feeling the pinch', but receiving two dead legs and a 'Chinese Burn'. Courses perceived to be 'of limited interest' (I hear this a lot) such as archaeology are being threatened with the axe (or at least intimidated by an overtly aggressive looking stabby-stabby knife). In some respects, I'm very pleased to see that the discovery and investigation of Richard III is keeping archaeology in the news (and to such a massive extent) and, if it ultimately helps Leicester's recruitment whilst simultaneously saving another undergraduate archaeology programme, then so much the better. On page 3 of this week's Sunday Times Guide, in the UNIVERSITY OF THE YEAR section, Leicester comes second (behind Birmingham). Why? Well the Times makes that explicitly clear: "The commitment to academic endeavour is also evident in our runner up for University of the Year. Academics first floated the idea that the body of Richard III might be buried in the Greyfriars area of the city about 25 years ago. The subsequent dig in a car park and tests on the hunched skeleton discovered there proved that these were the remains of the last English monarch to die in battle. It was one of the outstanding academic discoveries of recent years." When you get to the individual university listing (on page 31) there's a big photo of Richard in the ground and the opening lines describing the university are all about the discovery, adding that archaeology "is one of a number of subjects in which the institution excels and which have been moving it up our league table"
See, archaeology CAN make a difference. Now, whilst I'm not suggesting we start digging up stray dead English monarchs (someone has, in any case, I believe already put dibs on exhuming Alfred the Great), I do think that universities can (and should) learn from this. Archaeology may be a relatively small recruiter at undergraduate level (when compared to Physics, Chemistry, Biology, Computing etc), but it is a big hitter as far as research, public interest and media impact goes. People are, by and large, interested in the past: who they are, where they came from, where to visit in the summer (and get some nice cakes and a pot of tea). Just because the subject is relatively small in universities, doesn't mean it is in anyway unsuccessful. Just because so many prospective students are being seduced by the lure of business studies and hard science (in the hope of getting a job at the end of it all) doesn't mean we should jettison all arts-based courses in order to create lumpen, one-size-fits-all-get-a-job-in-the-city-at-the-end degree programmes. Anyway, at the risk of entering in to a rant (and it's only week two of term), I'll leave you with this thought - Leicester are currently at number 14 in the Sunday Times University listing.......archaeology, it would seem, is working very nicely for them…. What you really need your university to do is dig up Kings Cross railway station and find Queen Boudicas tomb. Think of the publicity as every train to the north of England is cancelled! Has anyone found King Crimson yet? Thanks, yes I did discover King Crimson way back in the early 80s. As he (they) were not to my taste, I quickly put him (them) back where I found him (them), never to be exposed again.....I can draw you a map of where he (they) were last seen though, if you're interested.